I’ve just returned from my first trip to the amazing continent of Africa, and one of the countries I visited was Rwanda. During my visit, which was focused on seeing the mountain gorillas made famous by American Dian Fossey, I also enjoyed hearing about the rebirth of a nation that had been so deeply affected by the genocide, which occurred during the 1990s. Africa Rising Cycling Centre (ARCC) has taken a bold and gigantic step of investing in young African women cyclists from Rwanda, Ethiopia and Eretria, with the aim of creating a professional women’s cycling team to compete at the highest level internationally. The success of ARCC with the men’s team is attributed largely to the professional manner in which the centre is run coupled with support of International sponsors the Federation and the government of Rwanda. A host of talented riders have come through the ranks to join big pro team with Adrien Niyonshuti the most prominent athlete riding on the UCI world pro Team, Team Dimension Data. 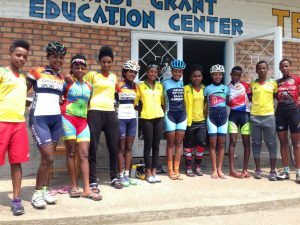 With a proven track record of having successfully birthday and natured cycling in Rwanda it is only a matter of time before we see African Women on the pro circuits in Europe, Asia and the USA, courtesy of the ARCC women’s program. However the path to success for women cycling is littered with hurdles that have dogged women not only in sports but also in the social, corporate and political world. Women world over, continue to face division and discrimination in sport, they still struggle for the recognition their male counterpart take for granted. The Patriarchal African society is profoundly biased against women taking up roles in public life. However resilient women continue to agitate for their voice to be heard, and as a result, we have witnessed an upsurge in the number of women in political leadership, corporate world, in education and a myriad of other leading roles in society. There is a huge gender disparity when it comes to sports, and more so in Africa, this is due to various factors, discrimination, gender stereotyping, low priority for women’s sports, conflict with cultural and religious beliefs, household and family responsibility, lower socio-economic status which dictates that women place a priority to employment as oppose to engaging in sports, a lack of equal opportunities in sport that allow women participation, education and funding. Sports can provide alternative careers pathways opportunities for women as opposed to traditional roles assigned to them, not only can they be athlete, but can also venture into sports management, sports medicine and coaching. However, these roles require formal education in their respective disciplines such as sports sciences; sports administration and management, once armed with the relevant qualification women will be in the position to manage both women and men’s sports. It has been demonstrated that men and women make equally good leaders, in spite of this fact, women are grossly underrepresented in the position of decision making, coaching and employment in sports, it is the men that are in the driving seat of major sports institutions when it comes down to important decision making. This result in the implementation of policies that do not address inequitable distribution of resources, wages and price money for sports women. Women’s sports lack media coverage, this is a great handicap when seeking sponsorship for women’s sports teams and events. Sponsors and partners count on the teams’ visibility to promote their goods and services, teams need to deliver on this in order to continue attracting and maintaining Sponsors. Without significant media exposure, sponsors shy away from women’s sports as it does not guarantee ROI. There is a need for sensitisation and training programs that highlight the gender imbalance, formulating of policies and programs that promote gender equality in all government and non government institutions. It is with great optimism that the African Rising Cycling Centre will not only revolutionise the African cycling scene forever, but its success will go a long way to the empowering of women in all walks of life in Rwanda and beyond. Kimberly Coats (Director, Africa Women Cycling): “When I watched the Olympic women’s road race and saw so few women from Africa, I knew it was time. Our goal at Africa Women Cycling is to raise the level of cycling in Africa for women and when I saw how great the women were at our recent pan-Africa training camp, I knew we should now put a marker down and start getting African female talent into the same world as the pro riders. We firmly believe these women can begin to race against the best talent in the US, Europe and Asia to demonstrate the potential of African cycling. We have seen with Team Rwanda how a dedicated, well-run program can flourish on this continent to allow riders to then go to the international scene on pro teams and compete with pride. We hope to enable many African female athletes to follow a similar route. African Women’s Cycling is on the rise. We’d love to hear from you about your own experiences. Share via comments or the Women Who Cycle Facebook page.